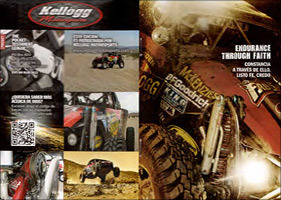 Kellogg Motorsports is a well-known racing team focused on desert races like the Baja 1000. The cover shows action photos from Kellogg Motorsports, sure to get the adrenaline pumping for race fans. The headline is "Endurance Through Faith," in English and Spanish. This cover, produced in partnership with the team, features a bilingual English-Spanish edition. Includes a plan of Salvation illustration and decision page.